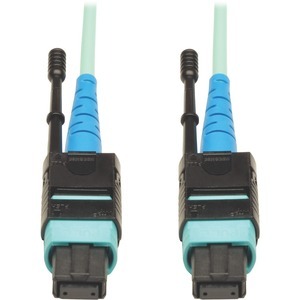 Tripp Lite MTP/MPO to MTP/MPO fiber patch cables allow high-density connections between network equipment in telecommunication rooms. They feature Push/Pull tab connectors that offer maximum accessibility in high density installations; install / remove with one hand. The MTP/MPO connector is approximately the same size of a SC connector but since it can accommodate 24 fibers, it provides up to 24 times the density, thereby offering savings in circuit card and rack space. N846 series cables are manufactured using laser-optimized, 50/125, OM3 multimode cable, and support speeds up to 100GbE.